The panelStack component can be used to toggle the display of content between different sources. 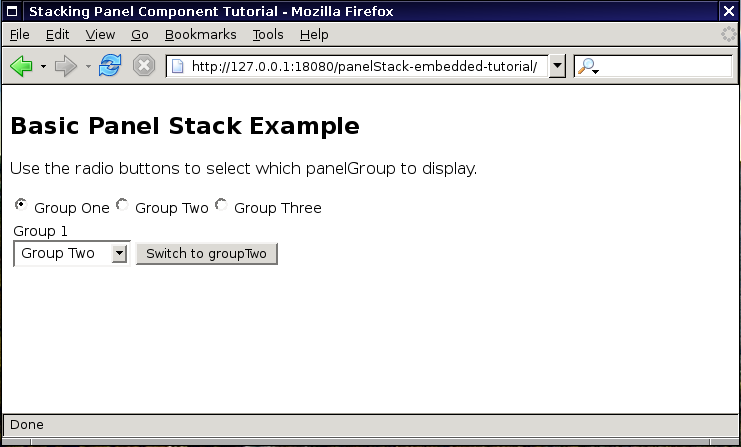 The panelStack selects one of its child panelGroups to be visible such that the panelGroup's id matches the value of the panelStack. The Stacking Panel involves two elements: the panelStack tag itself, which controls the visibility of the panelGroups using its selectedPanel attribute; and its child panelGroups which identify themselves by their id. 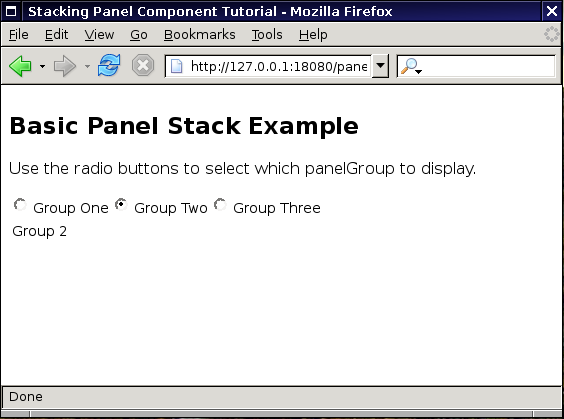 For the basic Stacking Panel example, three panelGroups are used. Each simply contains an outputText tag indicating to which panelGroup they belong, allowing us to see that the visibility is changing. The selectOneRadio component allows us to change the selected panel value in the backing bean. * allows the selected element to be changed with a UI control. * Gets the selected panel group. * Sets the selected panel group. The PanelStackBean must be instantiated in the faces-config.xml so that we can use it in our JSF application. Backing bean for Stacking Panel example. Download the panelStack-basic source code here. By default, Group 1 will be displayed. Use the radio buttons to select different Panel Groups. ICEfaces components and (X)HTML elements can be embedded within a panelGroup. By including components within a panelGroup we can also further show the ability to manipulate the panelStack via the backing bean. A selectOneMenu will be used with a commandButton to trigger a change in the panelStack value via an actionListener method. The PanelStackBean will require some additional properties to account for the new behaviour. Group one contains embedded components. Use the embedded components as an alternate way of switching between panels. Webmail Available in release bundles The inbox, contacts, etc. view is controlled with a Stacking Panel. Acronym Game N/A A Stacking Panel switches between displaying the acronym, voting, and congratulations.